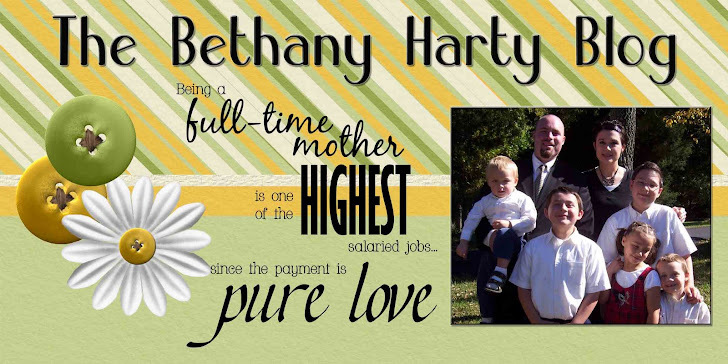 The Bethany Harty Blog: Thanks to Our Oregon Family! 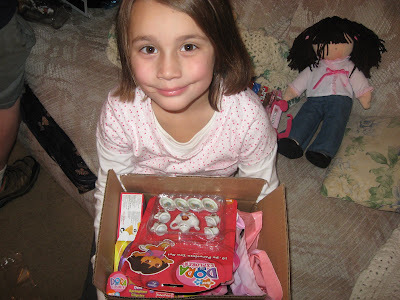 A few days before we left for North Carolina, we received a giant box of goodies from Mom. Inside, there were all sorts of treasures and presents! Things from Grandma Ida, Aunt Sue and Uncle Steve, Chrissy and AJ, and stuff from Madi, Joe, and Ella. Wow! You guys rock! 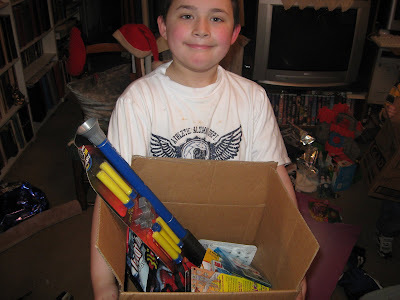 Here's Tom with his box. And no, it wasn't just a box that we gathered all of the presents into. That was the wrapping. I'm telling you, I kinda sucked this year on the "fancy" factor. Not so much of that going around. Oh well. Anyway, Tom (and all the kids) got money from Madi, Joe, and Ella, from Grandma Ida, from Aunt Sue, candy and gloves from AJ and Chrissy, and other assorted fun items from our Oregon Family. Thanks so much you guys! This kite looked really cool, but they opened it up before I could stop them. I managed to save 4 kites though. We'll fly them on a nice sunny windy day. I'm looking forward to it. I do like kites! Don't you? 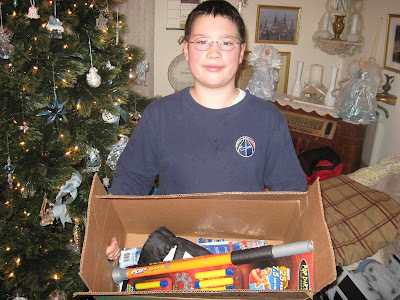 What would Christmas morning be without some sort of projectile launcher! Eme and Joe had a lot of fun with the tea set. And, if you look on the couch, you can see the beautiful doll from Randolph, Brandy, and Fan. Isn't it beautiful. It's from Pottery Barn. Thanks guys! Here's Jimmy with all of his treasures. The fun fruits were his favorite part. He ate them all within 5 minutes! Thanks Chrissy. And the binoculars were a big hit with Brent. He loved them. All the noise at random times. And the Flight of the Bumblebee song. Yeah, it was the highlight of his day. 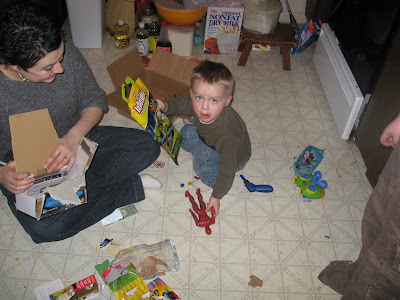 I love Christmas too... :) I think half - if not most - of the fun is finding things for my kids that I KNOW they'll love. 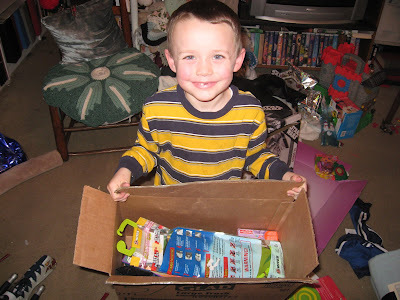 Looks like your kids got lots of stuff they'll love... :) fun fun.